Pork belly fries. Three of my favorite words in the English language in one sentence. This meaty snack is as good as it gets, perfect for a Paleo, Whole30 or low carb diet. And it couldn't be easier. Pork belly fries start with uncured pork belly, which my local Costco now carries. You have never seen teenage boys celebrate like mine did on the day they learned pork belly was readily available at Costco. Then, you cut the pork belly into thin strips and pan-fry them over a low-ish heat in a heavy skillet. When they're golden brown and crisp, you drain them on a plate lined with paper towels, sprinkle with salt, and enjoy. Not Ketchup Paleo fruit "ketchups," sweetened with real fruit and made without any added sugar, are the perfect dip for these pork belly fries. Use your favorite flavor! 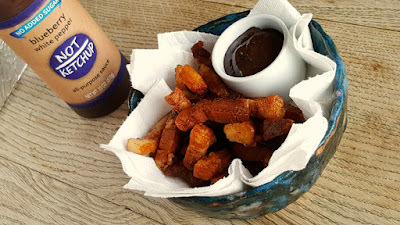 I prefer these pork belly fries with Blueberry White Pepper Not Ketchup, but Cherry Chipotle and Spiced Fig were also a hit with my family. A lot of fat will render out of the pork belly during the cooking process. You should absolutely, positively strain and save it; refrigerated, I've kept it as long as a few months. It's great for pan-frying onions, browning pork chops or even scrambling eggs. The flavor you get from cooking in pork fat is unbelievably delicious. Pan-fried nuggets of pork belly make a gloriously meaty, savory snack. 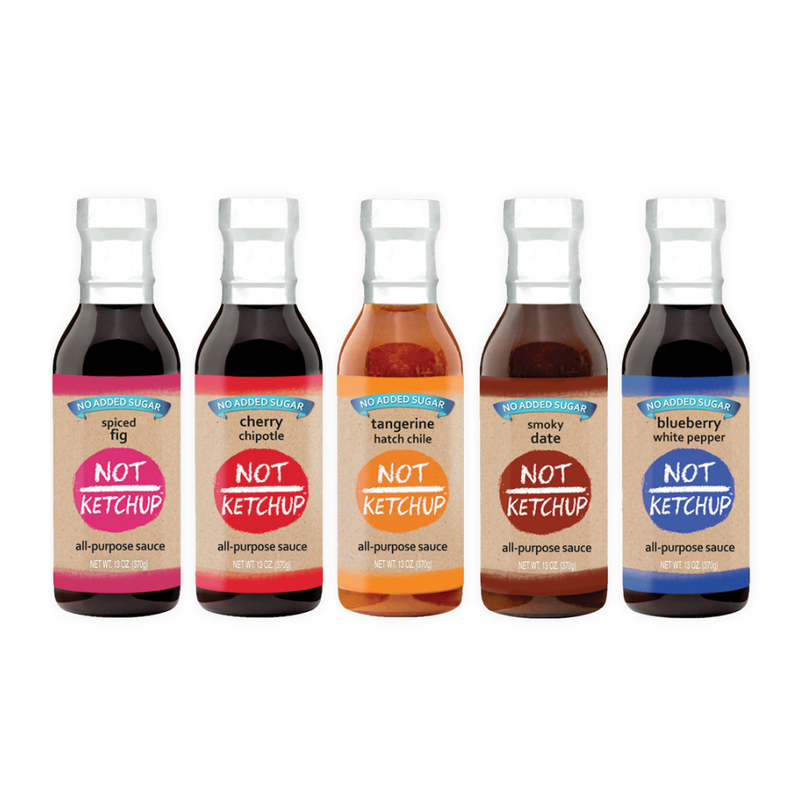 Serve with Not Ketchup paleo BBQ sauce. Slice the pork belly into thin batons, about 1 inch wide. Use a paper towel to blot them, making sure the pork belly pieces are dry.Put the pork belly pieces into a large, heavy skillet (do not preheat the skillet). 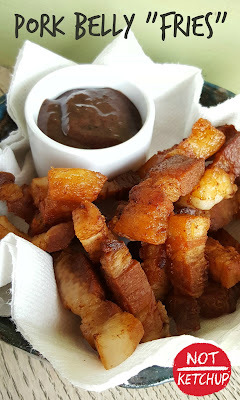 Over a medium-low flame, cook the pork belly fries, turning frequently, until crisp and golden, about 15-20 minutes.Remove the pork belly fries to a plate lined with paper towels. Sprinkle with salt. Serve hot with Not Ketchup for dipping.